I might die today, I thought. There is no seat belt. I have no seat belt to secure me on the road to Osh. 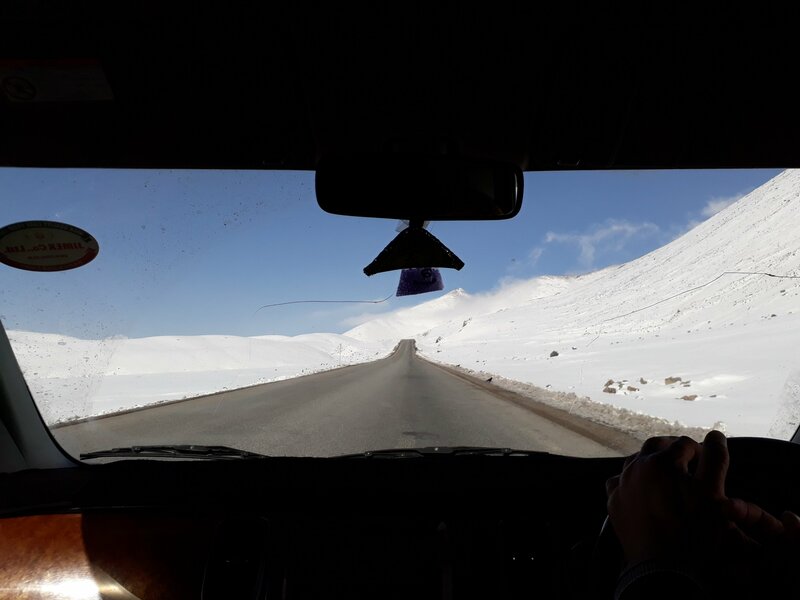 The taxi driver had insisted on driving me to Osh bazaar instead of the the Western bus station. He claimed there were many cars going from there to Osh. I would find one in no time. I thought he just wanted to shorten the ride but also that he might have a point. When we arrived a couple of men immediatley jumped on me and pulled me to their car. The taxi driver also got out like he wanted to do something but I ignored him. Straight to Osh! Straight to Osh! Good car! No, no, it’s 1000. I know. Ok, 1300! They are also paying 1300! They pointed at two young guys sitting on a bench. I looked at the big seven passenger honda car. It had darkened windows in the back, which I didn’t like. I was going to go on this ride just because I wanted to see the mountains. I said I was going to look around more and started walking but they pulled me back. This is a good price! And a good car! Straight to Osh! There were no other cars apparently going in that direction so I let them put my backpack in the trunk. It was a little after eight o’clock in the morning. As we pulled through the clogged Bishkek boulevards I felt bad. I had gotten the fold out seat without head rest in the second row. How was I going to sleep on this twelve hour ride? It was possible to look out through the darkened windows but the view wouldn’t be great. Why had I allowed that taxi driver to bring me to Osh bazaar instead to the bus station? Why didn’t I leave from there and find a better car? Also, there was no seatbelt. And as less traffic was blocking the road the driver was gaining speed. I might die today, I tought. And just because I didn’t stand up to one stupid taxi driver. 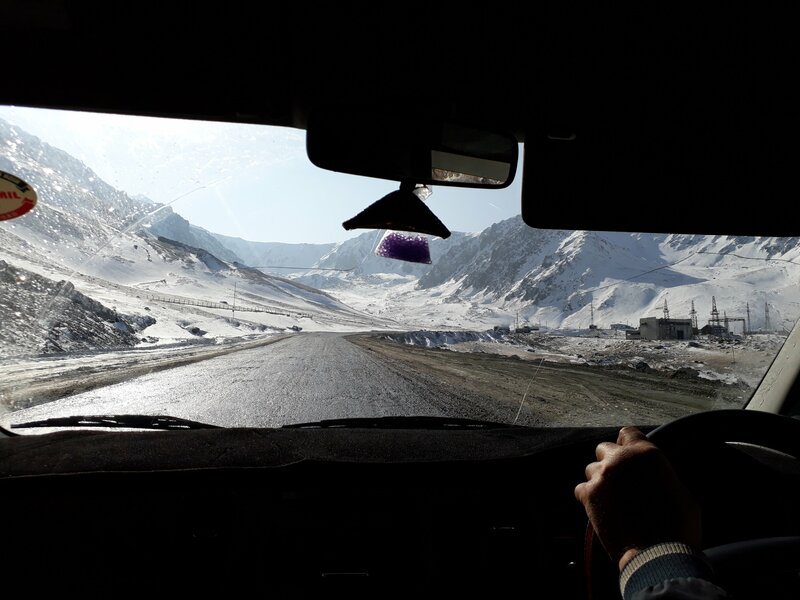 We stopped in a village outside of Bishkek to pick up the last passenger, a young woman. When got back in the car Anton, one of the two guys, offered me the seat next to her, in the middle of the second row. I actually had quite a good view through the front window from there. Another young woman was sitting in the front seat. In the back was the other guy and an old man with his little granddaughter. It turned out the two young men were construction workers from Tadjikistan who were on their way home from Krasnojarsk and Moscow. It had been cheaper for them to fly to Bishkek and take a car to Osh and then on to the border. 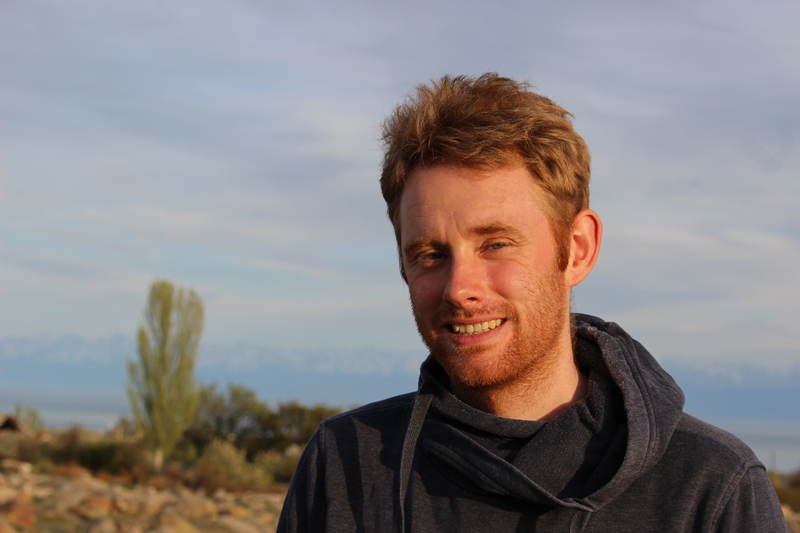 This is the first and last time I’m travelling through Kyrgyzstan, Anton told me. The taxi driver took money from us and then he took money from the driver to Osh. That’s how the taxi drivers do it here, selling their passengers. I realized my taxi driver had probably also wanted to sell me at Osh bazaar, but hadn’t managed because the Osh car guys had been to quick. They had gotten me for free. As we left Bishkek behind and the road started to rise I started to feel better. We passed a long line of trucks. They are waiting for the snow on the pass to be cleared, the driver said. You should come visit us in Tadjikistan, Anton told me, we have the most beaufitul mountains. And we don’t have beautiful mountains? the driver said. His point was proven when we entered in the first gorge between towering mountains. As we drove higher and higher up the road Anton and the driver discussed history. The Kazahks used to be called Kara-Kyrgyz, the diver said. Only later did they start thinking they were Kazahks. They are actually Kyrgyz. Samarkand and Bokhara used to be clean Tadjik. There were no Uzbeks there, Anton said. All of Ferghana used to belong to the Kyrgyz, the driver replied. There were no Uzbeks there. Just Tadjiks in the cities and Kyrgyz. Then some sly people came up with the idea they were Uzbeks and they took Ferghana from us. There didn’t use to be any Uzbeks. Uzbeks are very sly, Anton agreed. Many Russian lands are also Kyryz, the driver said. The Altai mountains and in the East there are still Kyrgyz living. Only they are not Muslims. I was still thinking about death and why there was no seatbelt. The road was however surprsingly good. The slopes were covered in snow by now and we got hear to the first mountain ridge. We passed a huge digging machine shoveling snow from the road. And then we were over the top and the road winded down into the next valley. Down there it was warm again and there were fields and horses and cattle. 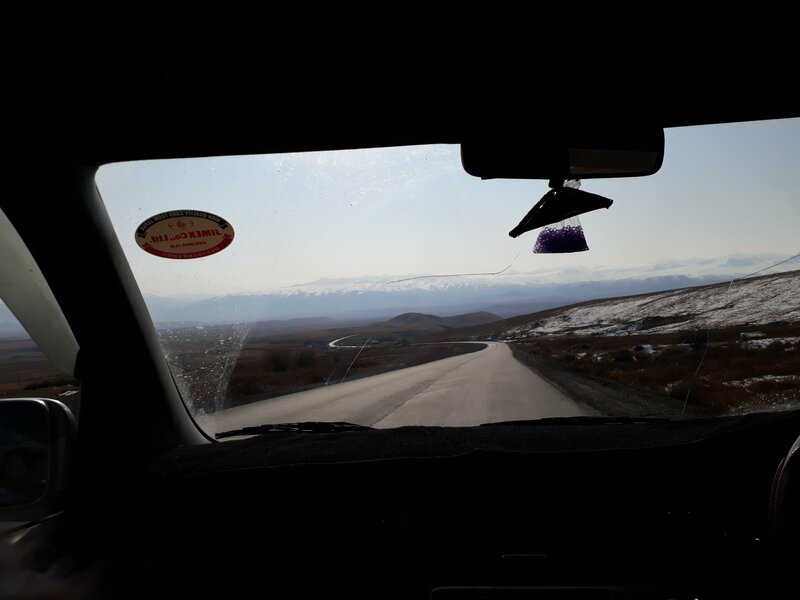 I felt like we had already come a long way from Bishkek but we had barely driven three hours. I fell asleep and when I woke again we driving through what looked like a gigantic steep frozen plain. That was the highest point, the driver said, after we had gotten over a little ridge. That was the top. Now it’s down all the way to Toktogul. It was twelve o’clock. We had been on the road for four hours. Just eight to go. We came into a narrow valley and there were many trees and bee hives next to the road. We stopped for lunch at a house built between the slope and the highway. Inside there was a piece of furniture I had never seen before. A large square bed with a table in the middle. I sat at a normal table with the two Tadjiks and we ordered lagman. The driver had kuurdak with the grandfather and while eating he lectured on history again. All soldiers in Genghis Khans army were actually Kyrgyz, he told us. Almost all the houses next to the road were restaurants. That was probably the only way to make money there. But how many people had to pass through here to fill them all? And how did people chose? When we came out of the valley the mountains around us changed. They became rugged and there were debris fields right up to the road. We reached a huge lake and I saw huge electricity lines on its shore. It got hot in the car and the driver kept opening and closing the window a little on his side and the side of the woman in the front seat. I realized she was only sitting there because the driver wanted to spend the journey talking to the most attractive female in the car. Let him, I thought, our lives depend on him being attentive anyway. And attentive he was, playing Kyrgyz and Russian pop from his mp3 player, but turning it down so it wouldn’t annoy anyone. When we came down into the valley again there was a man with just one eye standing on the road and the driver slowed down and gave him some money. The smell of sweat from the two Tadjiks got worse in the hot car. They hadn’t been able to shower since they left Russia. We got into a populated areas again and there were animals and school children on the road. It’s crazy, I thought, this road is the equivalent of a German highway in this country and they just let goats run on it. We passed Toktogul and another huge lake and I fell asleep again. When I woke up again it had started to get dark and we were no longer in the mountains and I saw my first cotton field. We passed village after village and the road was lined with tall trees. Smoke was in the air and cattle everywhere. South Kyrgyzstan. 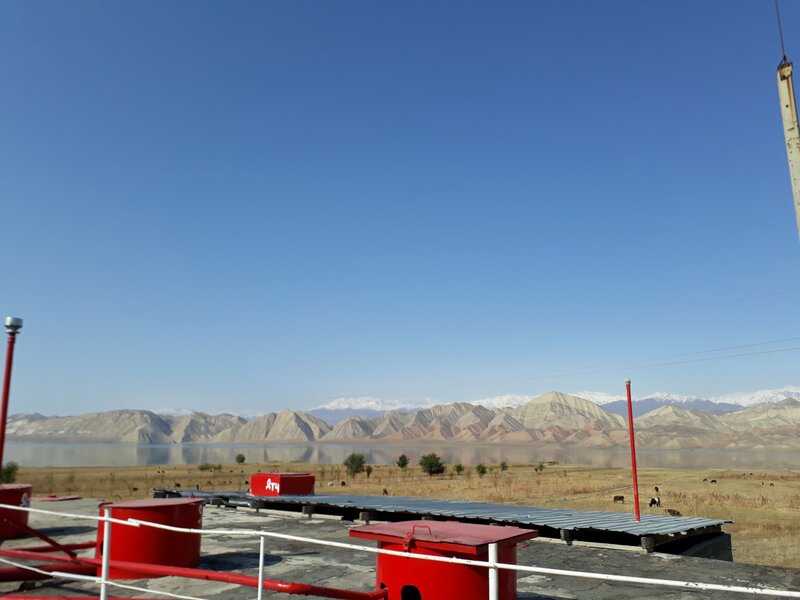 The edge of the Ferghana valley. At Jalalabad the woman sitting next to me got out. Still two hours till Osh. The two Tadjiks, however, had very little understanding of the geography of their neighbouring country. They kept asking if we had arrived. For some reason the driver started talking about Jews. He thought it would have been good to be born a Jew. They were all very rich, he said. They are the smartest people in the world, Anton agreed. They are sly, the driver said. I decided to change the topic so I asked the two Tadjiks if they were married. No, they said, they hadn’t been able to save enough money. Maybe next year. Did they have to find girls themselves? No, their parents were going to take care of that. Weren’t the women going to be alone if they worked in Russia? No, they were going to help their parents. Why couldn’t they live alone? You know how it is, we are a Muslim country, women can’t live alone. It’s too dangerous. If a women is alone she might do anything. Good women or bad women, when they are alone they might do anything. Their wives would not be allowed to just leave the house to go to the bazaar, they said. Only if they asked for permission and went with their parents. You have to hold a woman like this, the other Tadjik guy said, gripping his shirt tightly. We drove through barren hills in the twilight and the hills were full of sheep and goats. 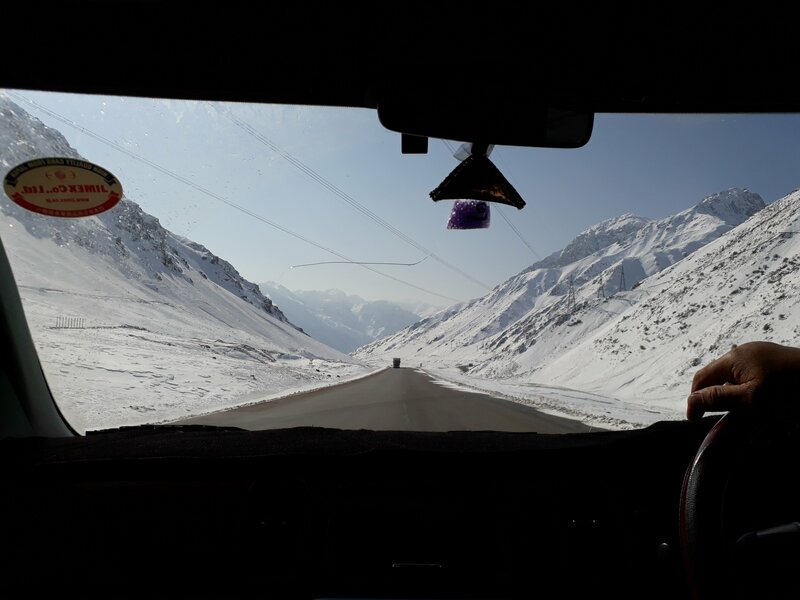 We had to make a detour now because the direct road from Jalalabad to Osh runs through Uzbekistan. 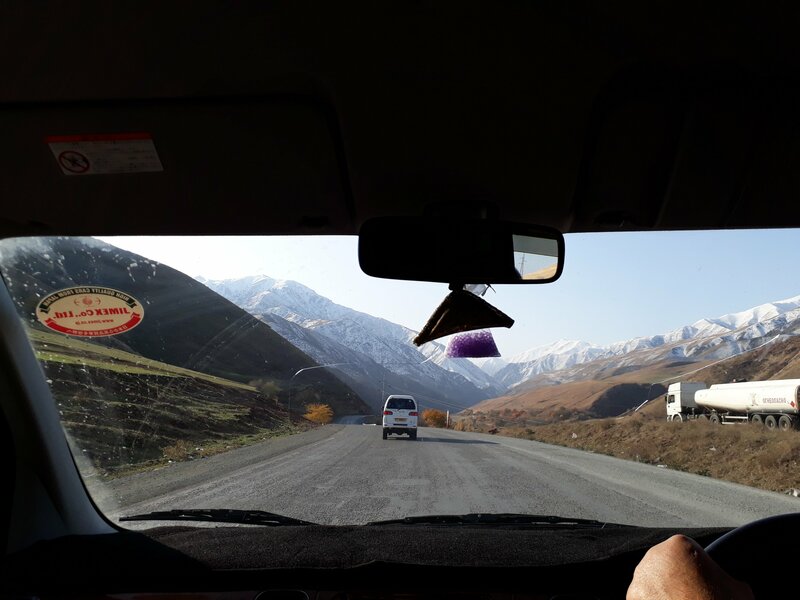 It was almost eight o’clock and pitch dark when we reached the outskirts of Osh and Anton changed into a car that would bring him to the Tadjik border and then the driver told me to get off and get a taxi into the centre. I had survived the road to Osh. Even without a seatbelt. You’re German? Teach me English!